The PowerAid® was developed to enhance your vehicle’s off-idle to mid-range performance and efficiency. The unique “Helix Bore” design of the PowerAid creates a spinning action of the incoming air. As air passes through your throttle body, this helical effect causes the air molecules to organize and maintain high velocity. The organization and high velocity of the air is extremely beneficial because it helps to provide a superior atomized mixture of fuel and air all the way into the combustion chamber. The benefits you will see are tremendous torque gains between 800 to 2500 RPM, and potential increases in your fuel economy, depending on driving conditions. 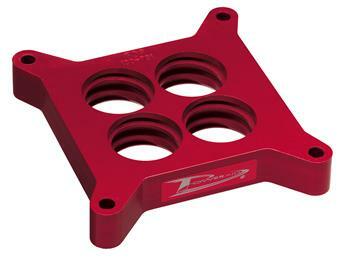 Our PowerAid Throttle Body Spacers are manufactured from the highest quality Aircraft Grade Billet 6061-T6 Aluminum. Each PowerAid is specifically designed for your application. Our kits always include the necessary gaskets, hardware, and precision brackets to maintain proper geometry with the factory components. The PowerAid Spacer can be installed in less than an hour using common hand tools with no drilling or cutting required. For the serious Sport Compact enthusiast, we have even more features and benefits for you. Some of our applications are drilled and tapped to allow for the addition or compatibility with certain nitrous “spray bar” type systems. * We like performance, and now you can add maximum performance and extreme power to your Sport Compact application without limitations. PowerAid Throttle Body Spacers are proudly Made in the USA, with the same level of quality control, fit, and finish you would expect from the rest of AIRAID’s product line. Just like our filters, PowerAid products carry our Lifetime “No Hassle” Warranty!